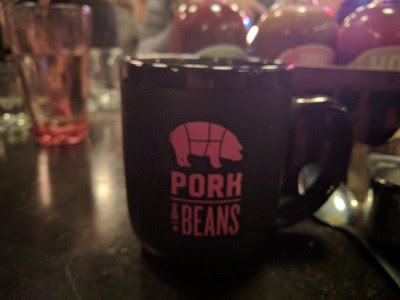 This past weekend we finally made it to Pork & Beans, the latest restaurant from Richard DeShantz Restaurant Group and with Keith Fuller from the now closed Root 174 as chef/co-owner (more info here). We met our friends S&R after we saw The Curious Incident of the Dog in the Night-time. We had made reservations for 5 but the show ended a bit earlier than we expected and since it was so darn cold outside, we didn't want to walk around town. So we went over and happily, they were able to seat us a bit early. We were a bit apprehensive about seating because of me in the wheelchair. 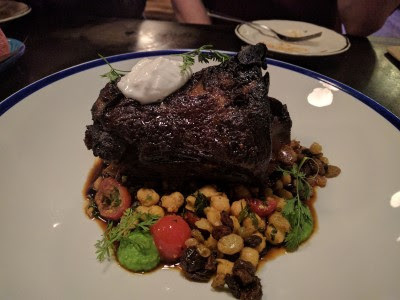 Meat & Potatoes is fine, but at Butcher & the Rye, there is 1 step up to the the non-communal seating or we can sit at the communal tables, which isn't the best option because of the long benches and trying to fit the wheelchair in and not be in the way or be disruptive with shifting the bench and/or table. täkō isn't wheelchair friendly at all - I believe when SP was there he said it was all high top tables and it was super crowded so it would be difficult if not impossible to maneuver the wheelchair. 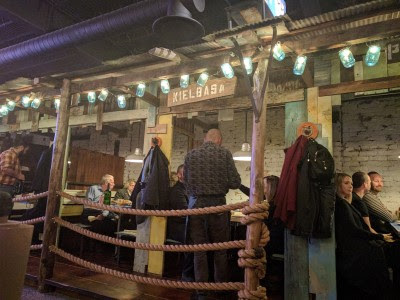 When he asked about a wheelchair person, he was told they would seat them next door at B&tR, which is a reasonable accommodation, but eating täkō food at B&tR isn't really the same as eating täkō food at täkō. In the front part of P&B there are a lot of high tables, but in the back are the communal tables which, happily, are not all bench seating but have chairs so one can easily be removed. The are some booths, but they are up a step. Kosher Brine). 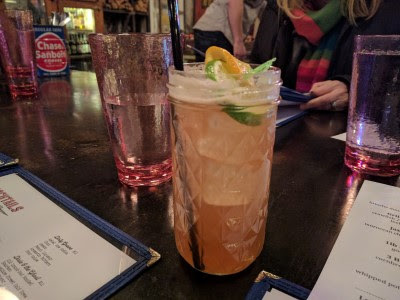 I wanted an iced tea while I thought about cocktails, but sadly, P&B doesn't serve iced tea. I was really surprised - no iced tea in a barbecue/smoked meats place?! I ended up enjoying 2 glasses of Chateau Tassin Bordeaux Blanc 2015, France (Draft). For beer lovers, there are a lot of beers available. 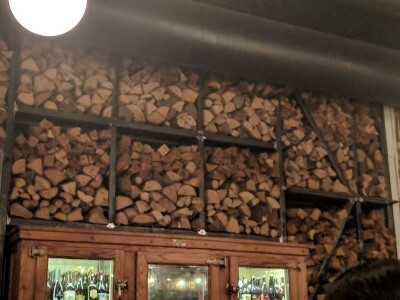 The decor made me think of southern smokehouse shanty. Mason jar lights, lots of wood and brick, rustic, a wall of wood for smoking. We ordered 4 appetizers and shared them. 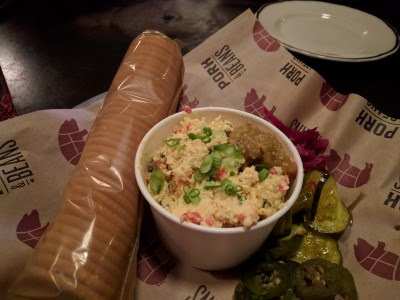 There was no way on earth I was not going to order the Pimento Cheese (house pickles, jalapeño, scallions, ritz crackers, green tomato mostarda). Pimento cheese is one my favorite things ever. Personally, I like the version we make at home. It's very basic, very simple. But I get that there are lots of versions and I certainly enjoy other versions. This was yummy. I think I ate most of it. I just cannot control myself around pimento cheese. It's like Chex Mix. 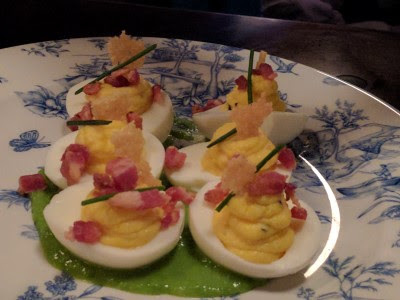 Deviled Eggs of the Day: with a mini parmesan crisp and bacon (pork belly?) with a chive. Also yummy. I never get my yolk filling that creamy and smooth. 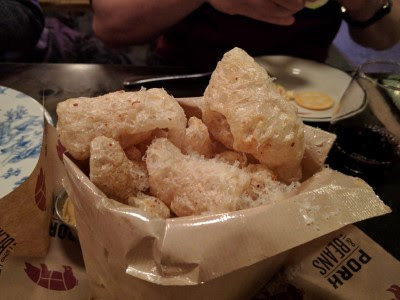 Pork Rinds (Chicharrones) (manchego cheese, tajin, chipotle remoulade). These were devoured. Much crunching and dipping. 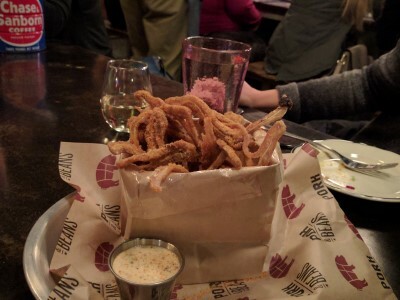 BBQ Chips (crispy pig ears, Alabama white BBQ sauce). There was a lot of crunching and munching and dipping as these, too, were devoured. 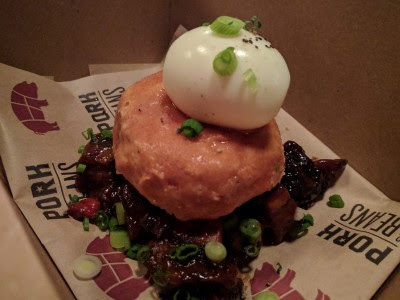 There was a special of the day that we felt compelled to order: BBQ Donut: smoked brisket, brioche donut with BBQ glaze, 6 min egg, scallions. This was good, but for me the star was the brisket & egg. The donut was just kind of there to sop/mop up the sauce and yolk. S ordered a special of the day: Lamb Neck with beans. It was enormous. He said it was good. 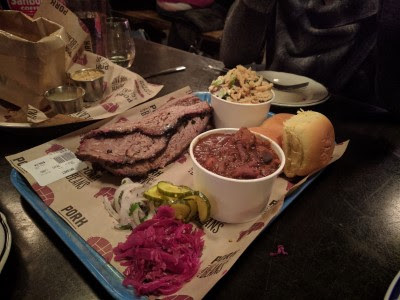 R & SP both chose the brisket. It's served with pickles, cabbage, and onion. 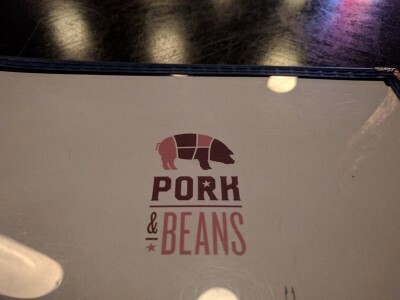 SP chose Burnt End Beans as a side. I thought R ordered broccoli slaw, but the online menu has broccoli salad or ranch slaw, so I'm not sure what she ordered. 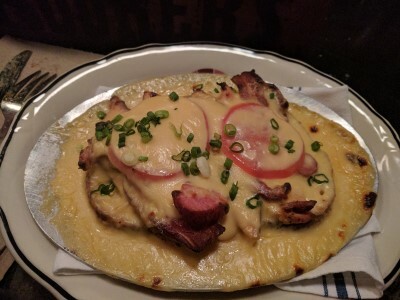 I think SP would have been shocked and disappointed if I didn't order the Kentucky Hot Brown (aka Devonshire) (house smoked turkey, bacon, tomato, cheese sauce, sourdough bread). It's one of my favorite dishes from when I was a kid. Delicious toasted sourdough bread topped with smoked turkey, thick bacon, tomato, and and just enough cheese sauce. It left you wanting more sauce but knowing that if there was more sauce on the plate, it'd be too much sauce. But you still wanted more. J & I ordered coffee after dinner. The men didn't. I wanted decaf, but P&B doesn't serve decaf coffee. What?! No iced tea and no decaf?!! Since I am a tea drinker (iced instead of soda because fizzy drinks bother my tummy; hot tea instead of hot coffee), when I do drink regular coffee it usually makes me a little jittery and it sometimes bothers my stomach but I figured I'd just eaten a ton of food so my tummy was "insulated" plus it was still early-ish so the caffeine wouldn't keep me awake. It was a large cup and tasty. SP helped me drink it all. Overall, we really enjoyed our meal at P&B. Our server was fantastic. We weren't rushed at all. Our food was smoky and yummy and there was plenty of it for us. SP & I both brought home leftovers for lunch on Sunday. I've been thinking a lot about that pimento cheese, so that's a sign it was a good meal.